The Model 300 Roundaire Mobile Fume Extractor with Activated Carbon is designed to protect the operatorâ€™s breathing zone from hazardous VOCs and odors found in many laboratory and industrial settings due to working with solvents, epoxies and chemicals. Capable of providing up to 530 CFM, the unit draws harmful odor and fume away from the operator at the source of emission; before contaminating the larger work space. 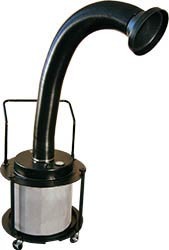 This system is equipped with a round disposable carbon filter containing 32 lbs. of granule activated carbon. When air is pulled through the carbon, the granules work to adsorb harmful chemical molecules and trap them before circulating cleansed air back into the room. The compact, Model 300 Roundaire comes with a sturdy portability handle and four industrial-grade locking casters; making moving this unit virtually effortless. The Variable Speed Control knob offers incremental airflow speeds between 175 and 530 CFM. Typical applications include: Laboratory fume control, parts cleaning and washing, epoxy fume control, conformal coating - dip or brush, and other similar odor control applications. All specifications are nominal and subject to change without notice. Not intended for explosive or highly flammable applications. (i.e. when the Lower Flammability Limit is exceeded for any given chemical). Please consult the specific MSDS for questions regarding flammability limits. *Results may vary depending on application and appropriate use of equipment.